The form of the oval face is concave-convex. The eyes are asymmetrical, one being round, the other in the form of a slit. Sculpted at one corner of the mouth is a sea otter, at the other, a whale; the middle of the mouth holds a salmon. The peripheral decoration of the mask is made of four plumes. On the front are three little spear points in wood. The ears are replaced by moving hands, of which the fingers have been painted red. The black line painted on the back of the hand was there to chase away the evil spirits. At mid-cheek, are two little arms. The chin is decorated with two wooden hooks and a little seal on a pike. Inside the mask, a bit allowed the dancer to hold the mask between their teeth. 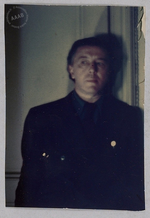 - Paris, Musée National d'Art Moderne/Centre Georges Pompidou, André Breton, La beauté convulsive, 1991, rep.p. 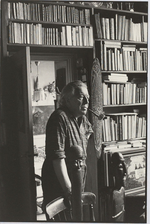 74 (photo dans le studio new-yorkais, 1945) ; rep. p. 76 (photo Sabine Weiss, 1960, dans l'atelier) ; rep. p. 375 (photo Sabine Weiss, 1955, dans l'atelier, L'œil n° 10, 1955). Bois, polychromie rouge, verte et blanche, plumes. From / Provenance Heye Foundation n° d'inventaire 12/0921, achat du Musée, échangé avec Julius Carlebach en juillet 1944.